Hundreds of netball players from Johor and beyond the state gathered at EduCity Sports Complex in Iskandar Puteri from 12th to 14th April 2019 to compete in the inaugural ‘Piala YM Che Puan Khaleeda’. Emerging victorious from the three-day tournament were ‘X- J Team’ and ‘RMP Johor’ that won the top place in the Open and Closed categories respectively. Placing second, third and fourth were ‘EGuanna’, ‘PDRM A’ and ‘UTM’ teams (Open Category) and ‘Parlimen Simpang Renggam’, ‘SSTMI Diamond’ and ‘Flyball Queens’ teams (Closed Category). “Parents play a huge role in protecting, educating and loving their children. At home, they should forget about work and the stresses of the day and put aside their electronic gadgets when they interact with their children. They must pay full attention to the children’s wellbeing and fight any form of abuse towards them,” said Her Highness Che’ Puan Khaleeda Binti Bustamam, the consort of His Royal Highness Tengku Mahkota Johor, Tunku Ismail Ibni Sultan Ibrahim, in her closing speech. “We are very proud to support the growth of sports in Johor and are delighted to showcase EduCity’s modern facilities to all netball players and fans. The newly introduced cup is certainly an eye-opener and an inspiration to all netball players in the state of Johor – it is here that they get to showcase their practised and perfected skills,” said Datuk Ir. Khairil Anwar Ahmad, the President/Chief Executive Officer of Iskandar Investment Berhad. Also present at the closing ceremony was Wan Ahmad Saifuddin Wan Ahmad Radzi, who heads EduCity. More than RM10,000 were presented to the podium winners. The best players’ medal and trophies were also awarded to Fazira Mesnan from ‘X-J Team’ and Nor Kharteny Mohd Fuad from ‘RMP Johor’. 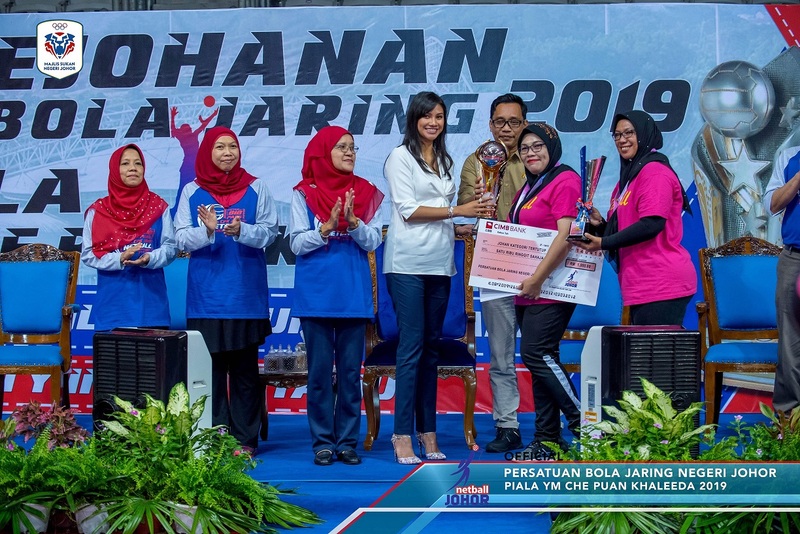 All prizes were presented by Her Highness Che’ Puan Khaleeda and the tournament was organised by the Johor Netball Association that is headed by its president, Hajah Alwiyah Talib. EduCity Sports Complex is the proud venue for Netball matches in the upcoming SUKMA Games 2020 in Johor.